Posted on Monday, December 19, 2011, by Eric - TV Geek Army "Revered Leader"
If you couldn’t tell already, we’re pretty big fans of Mad Men here at TV Geek Army. 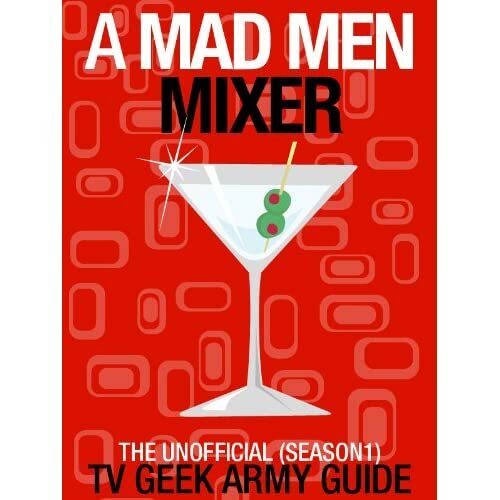 To help celebrate the holidays, we’re giving one lucky winner a copy of A Mad Men Mixer, a crisp and refreshing guide to Mad Men’s intoxicating debut season. It’s a TV Geek Army e-book original, and it’s only $2.99. And oh yes: we’re also giving that winner all four seasons of Mad Men on DVD! “I so hope that that one lucky winner is me. But I also hope entering the contest is super easy,” you’re thinking. It is super easy, so your hopes have been answered! Here’s all you have to do to enter. 2. Head over to our Facebook page and tell let us your favorite Mad Men scene of all time. The contest runs from now through January 3rd at midnight PST so enter now. And and: we encourage you to follow us on Twitter and like our Facebook page! And and and: for more detail and to purchase A Mad Men Mixer, head here. Thanks for taking part in the TV Geek Army's mission to provide serious TV news and reviews coverage for seriously geeky fans of great television!